Katarzyna Glowicka ventures into a modern interpretation of Shakespeare’s sonnets, for many one of the highest expressions of love in all of literature, but for others a controversial work, who argue that these texts are enigmatic and often contradictory. 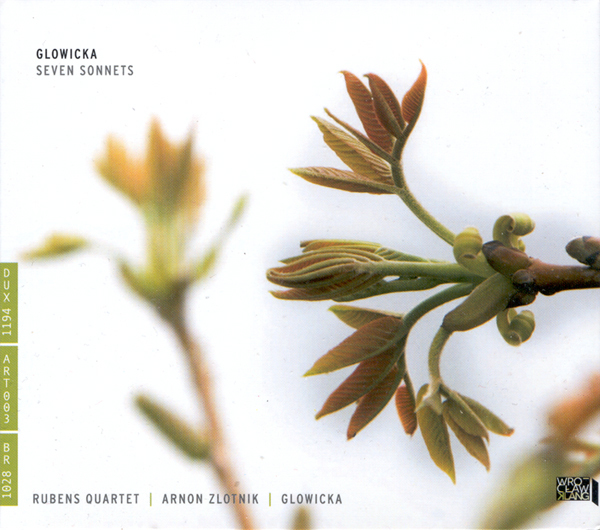 Glowicka has already been inspired by the poems of the great Bard as early as 1999to produce a collection of three short compositions: Sonnet 24, 109 and 102, respectively “My eye hath played the painter”, “Oh never say That I was false of heart” and “My love is strengthened.” She added four more to these ten years later: “When my love swears”, “Love is too young”, “Sweet love” and “All naked.” Everything is now collected in a CD published by ARTEksounds and supported – among others – by The Netherlands Performing Arts Fund. Katarzyna Glowicka has masterfully led the musical project on a suspended ridge between tradition and modernity. With the Rubens Quartet and Israeli countertenor Arnon Zlotnik, she modulates the properties and idioms of early music with modern techniques, articulating melodic harmonies with an electroacoustic approach, real-time electronics and chamber music. Between romantic hints and spiritual environments, the seven tracks are all very enjoyable. The composer is no stranger to the melting pot of different cultural areas, with collaborations between theater and music. Indeed, Glowicka has shared stages in the past with choreographers and visual artists and is absolutely at ease with all references, having developed the project so long. Over the centuries William Shakespeare has always fascinated legions of other artists – and, not surprisingly, his sonnets were also set in pop guise by David Gilmour of Pink Floyd – however, the suggestions here are much intense and significant and they bring us closer and more directly in contact with the original work.